There’s certainly ups and downs. One of the downs, it feels like, is that suddenly you don’t see the people you saw every day for a whole semester every day any more. Whaaat, we don’t live in the same building any more? Life is busy and it’s hard to make plans now that we can’t just run into each other in the lounge? We can’t just plan a weekend trip to another state because we have jobs and increased homework now? Preposterous. Luckily, the Study Abroad office here has social events covered. I went to the Study Abroad Alumni social there and ran into not only my closest friends (with whom I had already arranged to meet there) but also some friends that I hadn’t seen in a long time, friends that I saw often while I was abroad but, because I was abroad again and they weren’t, I lost touch with. 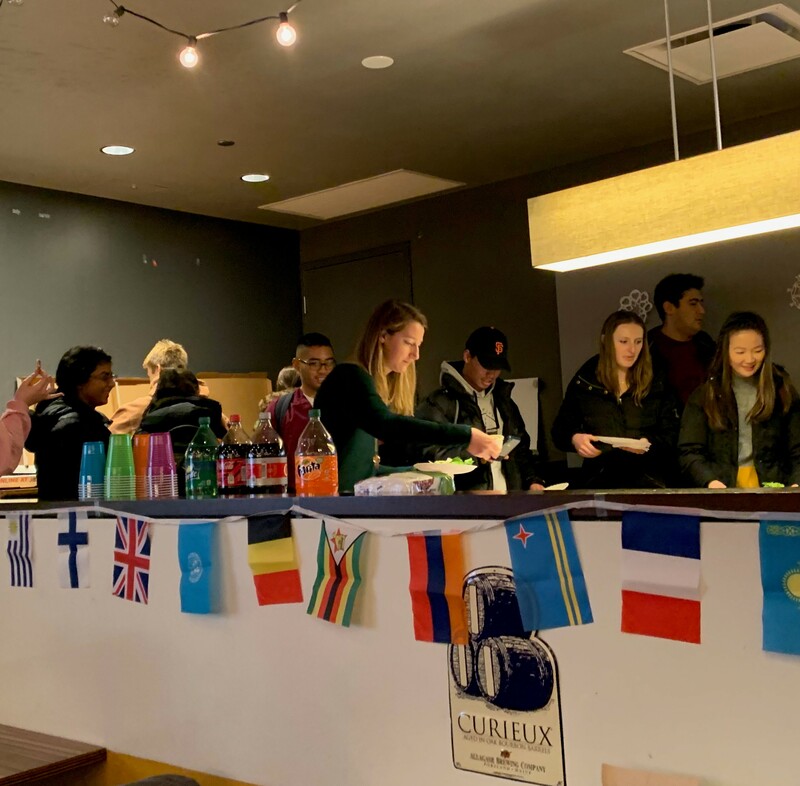 The Study Abroad Alumni social wasn’t just open to alumni – nope, it was totally cool for people interested in studying abroad to attend too, so I got to talk with some students who wanted to talk with people who had been abroad. The event was held in Ireland’s – it’s the campus bar, right in our Damen Student Center, a pretty cool place to do your homework until (if you’re over 21) the night comes and your friends arrive but you don’t want to go off-campus. Plus, I mean, they had free food from Felice’s, our student-run pizzeria, so how could anyone say no? So, the moral of the story is: Loyola takes care of her students who go abroad, from the moment you decide to go to when you come back, if you so wish. But it was really fun! If you’re even thinking about studying abroad, no matter what school you go to, I definitely recommend chatting with students who have already gone. I mean, I met a girl who had spent the semester in Russia! I didn’t even know we had a program that could send students there! Way cool! So, here in Beijing, we have a special program unlike the Rome Center – you have the option of having a Chinese student of the University of International Business and Economics as your roommate! Of course, you don’t have to, you can elect to have a fellow American student as your roommate, as long as you both have specified you want to, or you can live alone – or even live in an apartment-style dorm in a different dorm. But all those options are more expensive. This semester, only one guy lives alone, and everyone else has a Chinese roommate, or CR as we call them. Trust me, you want to live with them. Not only are they incredibly useful (drag them to the bank, the restaurants – they know the area- and so on, due to being fantastically bilingual) but the TBC screening process means that they are all incredibly nice, wonderful, delightful people and make fast friends. They’re so cool, and come from all different places across China and are interested in all different things. There’s one this semester who is captain of the alpine ski team, another who is really into Korean culture and dance, another who you can always find cooking in the kitchen, and another who you can count on to always be studying in the lounge, and so on. At first, you might be a little wary, especially you reading this if you haven’t even been to college yet first. But I assure you, the Chinese roommate experience is so awesome! It really helps you get immersed in the Chinese culture and university life. Unlike Rome, you’re not in a bubble. For example, WeChat games (see my last post) spread like fire between the CRs and the students, since even though there’s a language barrier some games don’t even use words, so – bonus! Plus, if you have a roommate like mine, they’ll make sure you celebrate Chinese holidays the right way, with the right food. I’m very lucky, since we’re fully in the holiday season, since sometimes I come back from a day of classes and Thea is waiting for me with some new treat or another. If/when you come to TBC, I would highly, highly suggest getting a Chinese roommate. When else will you have this opportunity? With the CRs, we do all sorts of things – from watching Mulan and laughing at the cultural inaccuracies, to walking around the Temple of Heaven area and pretending one of them is secretly famous, and so on. In Rome, I didn’t meet a lot of Romans my age, much less be able to call them my friends. These CRs, it’s only been two months, but I’m very certain that in the future when I come back to China, I won’t miss out on visiting them and seeing them when I can. Plus, TBC also works hard to match you with a roommate. They won’t put a very clean person and a very messy person together, or if you’re a person against smoking, they won’t put you with someone who smokes heavily (none of the CRs do this semester), just like Loyola does. All in all, I would more than recommend getting a Chinese roommate. When you’re studying abroad, go the whole yard for new experiences, and don’t be afraid to live with someone from a completely different culture! I wrote an article a while ago about apps you’ll need for college life, such as Venmo and GroupMe. Well, you need a whole host of other ones to really do well in China. And, pro tip, but don’t come here with a Google phone. One of my friends has hers with and it’s a huge pain! WeChat, or WeiXin as they say in Chinese. It’s ubiquitous, powerful, and doesn’t just change the game – it makes its own. On the surface (and in the USA) it’s just a messenger app, like GroupMe, Viber, or WhatsApp, but it can also be used to ‘follow’ news companies with an RSS feed, and you can post ‘Moments’ just like Facebook updates. But wait, there’s more. Through WeChat, you can pay for your meals at almost every single restaurant, because you’re infinitely more likely to forget your wallet than your phone – and you don’t have to pay those pesky international cash withdrawal fees because it connects right to your card. You can pay your phone bill or order a taxi. 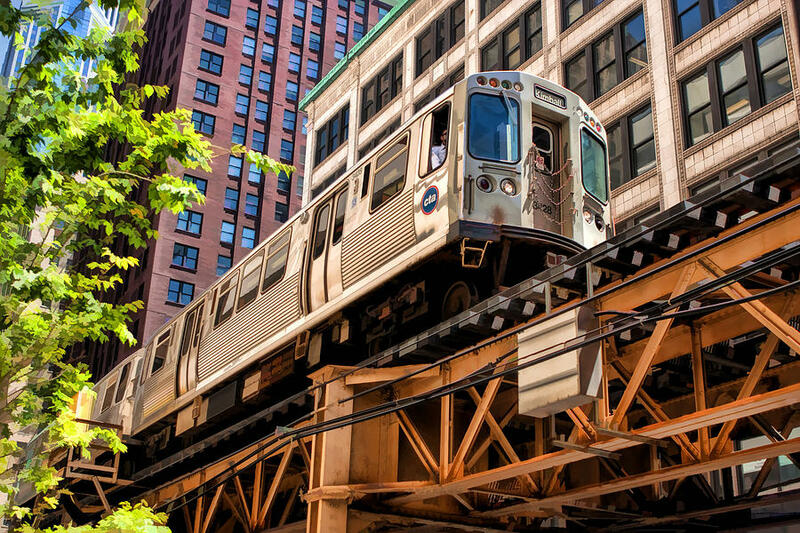 You can rent a bike (more on that later), buy your train or movie tickets, and play games like it has a whole entire App Store (but free) inside of it. Right now, the game sweeping TBC is called ‘Tiao Yi Tiao’, or Jumpy Jump. It’s hot competition to see who can keep their jumping streak furthest without falling. It’s magic and it runs the world. Of course, it’s only so big because the Chinese government keeps a good eye on it, so you shouldn’t be spreading anti-governmental messages through it (if you’re the type of person inclined to that, which I wouldn’t advise while in China, but that’s your choice) but all in all it’s one you absolutely need while in China. Second, ofo. Well, actually, there are a variety of apps just like ofo, and you can have one or them all, but I prefer ofo. Why? Well, ofo is a bike-sharing app. It’s sort of like… the exact opposite of Uber. There’s probably millions of the bikes in just Beijing alone, and all you need is the app to take one. You simply scan a QR code on the bike, type in the passcode your app tells you too, and the bike unlocks – and off you go. Sometimes the bikes are not all that good, but there’s certainly another one you can take. And it’s dirt cheap – as in, I haven’t yet paid a single kuai (six-ish kuai is one USD) for all my rides, whether they’re five minutes or fifty. Plus, at the end of every ride you get a two-kuai coupon, so even if you do generate a bill of a kuai or two, you still won’t pay. They’re ridiculously convenient. I often walk to breakfast and then bike across campus to class, just because I can, or bike down to the nearest mall. It’s something that probably wouldn’t go down too well in the United States, because a huge team of people are in charge of finding wayward bikes (you can just leave them wherever you want, they require no charging stations or anything) and setting them up along streetsides so you can get to them easier. At least, I feel like people would complain in Chicago. They do take up a lot of room. Another bonus about the app is that it will tell you where the nearest ones are, so you don’t even have to look hard! Also, all ofo bikes are bright yellow. They sure stand out! Mei Tuan combines literally every other useful American app into one. And by that I mean it will deliver literally anything you can dream of. Gone is the need to compare GrubHub, UberEats, Postmates, and the other food apps to see who has the restaurant – and the price – you want. No joke, today in class as part of our lesson, our teacher had me order cookies from Subway to be delivered. Just cookies. (They were amazing.) From places like DQ, Subway, Pizza Hut, and McDonald’s to the local tiny restaurants that only recently moved to take WeChat pay, Mei Tuan will bring you anything you want, ever. And… Not just food. My homework tonight is to make a list of summer clothing I’ll need for my spring break trip to Thailand, so my teacher can help me order it during class tomorrow (there’s only two students in the class, including me.) From an iPhone X to a rice cooker to just a roll of tape, Mei Tuan can bring it to you the same day. You can get larger things (like a box of water bottles or a Ferrari car) on a similar app called Taobao that doesn’t do fresh food, but if you hate Amazon’s two-day delivery …. Mei Tuan has you covered. My friend once ordered an iron and got it within the hour. Possibly the best thing? It connects to your WeChat, which connects to your card, so you don’t need to input your card over and over again. Of course, you’ll probably want a variety of other apps, from Baidu Maps (Google Maps doesn’t work here) to Elk (a currency converter) to Didi (like Uber, but also uses the taxi fleet) but I think WeChat, ofo, and Mei Tuan are the top three. Come study abroad here and you’ll see for yourself! Last semester I told you all about my favorite restaurant in Rome, Osteria dell’Anima, with the pear pasta I dream about sometimes. Although it seems I eat out for every meal here in China, there haven’t been many times where I eat out downtown instead of around the campus, because unlike Rome, there are restaurants taking every inch of space at UIBE’s perimeter. So let me tell you about Hangzhou Xiao Chi, which is located just three steps outside of East Gate, or as we call it, Eats Gate. I really wish the internet would cooperate and let me share pictures with you, but when I get back to Chicago you betcha I’ll upload them on my first day of work. You’ll just have to trust me right now. Hangzhou is owned and operated by one small family from, you guessed it, Hangzhou City. They’re adorable and I love them. Just like a lot of small family-owned restaurants here in China, it’s not always easy to tell how exactly they’re all related, but they usually are. Hangzhou has two Ayis, or aunties, three Mei Nus, or daughters/younger women who help out, and then four Shu Shus, uncles, who do the cooking. The restaurant is about half kitchen and half seating area, and the seating area is six tables with small stools to sit on instead of wasting space with real chairs. It’s always packed. They serve both baozi, stuffed steamed buns, and jiaozi, dumplings, as well as about a hundred (that’s an exaggeration – perhaps fifty really) dishes, although I prefer to get their vegetable noodle soup, so then I can add anything I want, or otherwise I really enjoy their Chongqing noodles, which are flavorful, with chicken and peanuts, and spicy as all get-out. They speak no English, but they’ll teach you the proper pronunciations of whatever food you want, and they have pictures posted of their most popular foods so you can just point. And ‘baozi’ is the easiest thing to say. You can’t visit Hangzhou Xiao Chi without getting a ‘lou’, or a plate of them. TBC students are currently heartbroken because one of the Ayis went back to Hangzhou for Spring Break and won’t be coming back until next semester so she can help her daughter study for the college entrance exam that all Chinese kids have to take if they want to go to college. Eating at Hangzhou is like eating a home-cooked meal made with love, and the staff there can recognize all, if not most, of the TBC students by now. We go there… a lot. I’m not going to lie, before Spring Festival there was a week where I went every single day for seven days straight. I can’t help it. For ten baozi and a bowl of warm noodles, it’s less than 20 kuai, which is about three dollars. Three dollars! I’m going to cry when I get back to Chicago at the prices. You can’t, and won’t, miss Hangzhou Xiao Chi if/when you come to TBC. Did I make you hungry? I’m pretty hungry myself. Guess I know what I’m having for dinner tonight. New Years, again? In many parts of Asia, New Years is celebrated based on the Lunar calendar rather than the traditional Gregorian calendar starting on January 1st. This year, New Years falls on February 16, 2018 and it so happens to be the year of the dog (based on the 12-year zodiac cycle). Those who are are born during the year of the dog are known to be communicative, serious, and responsible in work! 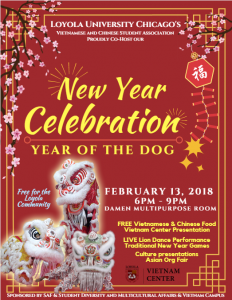 Here at Loyola University, the Vietnamese and Chinese Student Association (VSA & CSA) have put together an event to celebrate this fun and joyous holiday. Our event will take place on Tuesday, February 13 at Sr. Jean Dolores Schmidt Multipurpose Room (North and South) from 6:00pm to 9:00pm. VSA & CSA have been planning for 3 months to bring to the Loyola community a wonderful cultural experience of New Years. We will feature cultural and study abroad presentations, a lot of Asian-based organizations, traditional games, and a prize booth. Nevertheless, it will be an event in which offers inclusiveness, educational components, and tons of fun for everyone. 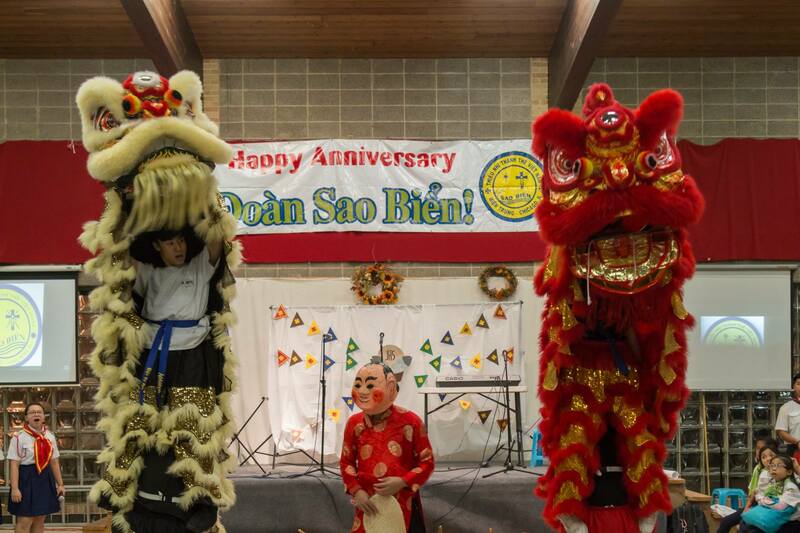 In addition to all of this, VSA & CSA have worked hard to bring in traditional lion dancing for entertainment! The event will comprise of 2 performances. 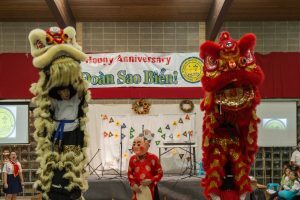 The first performance will open up with lion dancing. As customary, they will wake up from a slumber and dance to the sounds of the drums and symbols. To bring good luck to this event, they will perform the “Choy Cheng ” ceremony in which they will receive their lucky money. After, the students may even get to interact with them, as they are playful and social! Their second performance will be focus on-stage with many tricks as people sit and enjoy their food. In terms of food, we have a variety of Vietnamese and Chinese options. 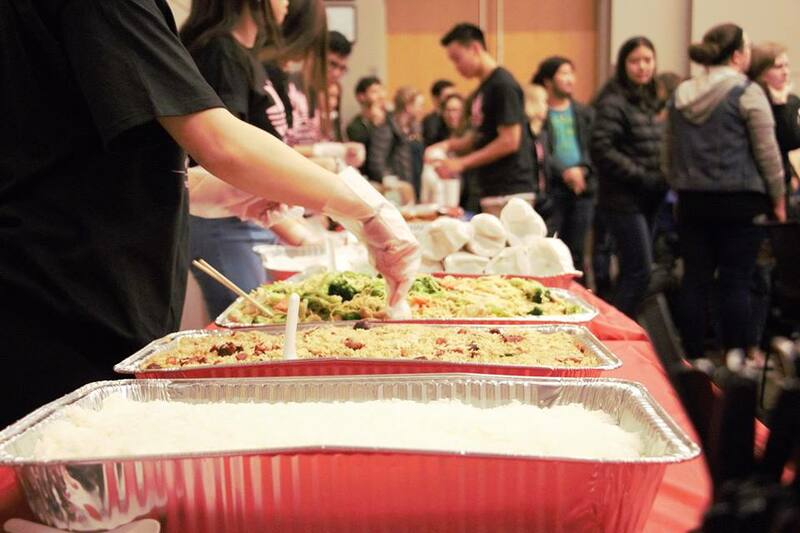 As learned from VSA’s recent Cuisine Night event, we have ordered sufficient food to accommodate the large expected attendance and considered many vegetarian options. On top of all this, we have dessert! 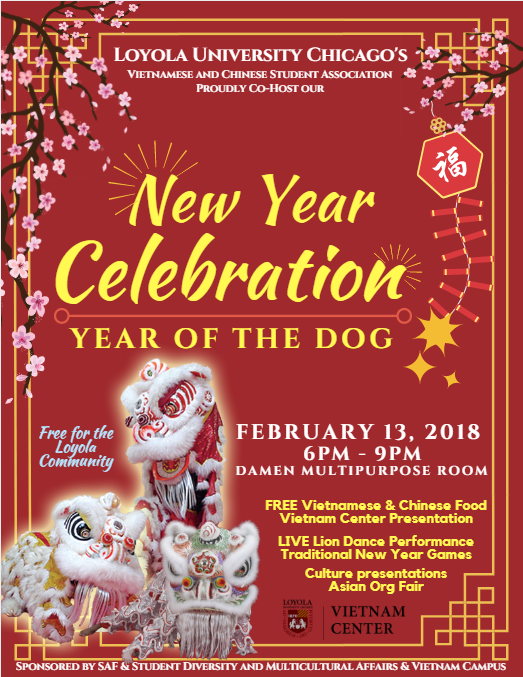 We will have traditional New Years cake, known as Nian Gao, cuties, fortune cookies, Vietnamese Banh Cam, and an assortment of candies. For Loyola students, this is free admission and with free food, so we hope to see many LUC students attend! New Years is primarily a time for celebration with friends and family. It is a perfect time to get together and have fun with each other. We hope that the Year of the Dog brings you luck, happiness, and prosperity to you and success will happen throughout the year! See YOU at our event on Tuesday, February 13 6pm at Damen MPR! I think one of America’s biggest stereotypes of Chinese students is that they are very, well, studious. It may not always seem that American students are just as much, especially if you aren’t in university or don’t know many. But trust me. Even in Chicago, even in Rome, especially in China, we American students have our nose to the grindstone! That’s really been what I’ve been up to. Study, study, study! I feel like I need to learn Chinese to talk to my grandparents and to get around here in Beijing, but if I never learned more I would be okay. Not too great, but alright. Like I said last post, though, some people came here with no Chinese experience. In fact, one girl never left her home city before coming all the way here! She’s very brave. So everyone is studying very hard – I’m actually sitting in the quiet section of our lounge right now, and every sitting spot is taken. And it’s a Sunday night! The only sounds I can hear are the clicking of keys, the smacking of pens being flipped around, and music slipping out of people’s headphones. And the sipping of bubble tea. Of course bubble tea! It’s China! 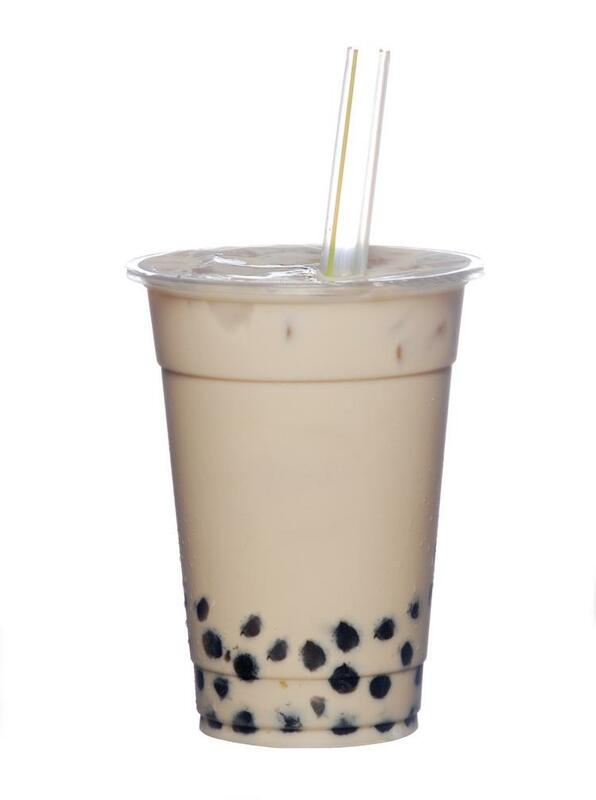 Although boba has only swept into mainstream American foods/treats in the recent years, I have to say, we practically landed here right onto a bubble tea stand – I feel like there’s not an hour that goes by without me seeing the drink in someone’s hand. Here, you can get it warm too for this cold, cold weather. I never knew that in America! Trust me, if you haven’t tried bubble tea before, you absolutely should. Even if you don’t like tapioca pearls or the textures of the myriad other things you can put in it, there’s an endless variety of options. You can get it without the bubbles, in hundreds of ways! Plus here, unlike some places in the US that I’ve had, you can also get different levels of sugar and ice depending on your preference. Talk about endless options! What else has been surprising but shouldn’t have? Well, I’m sure I already mentioned the heaven of food I have here. And how cheap everything is? This past weekend, I bought a blanket from the shop Uniqlo for 79 kuai, or about ten dollars. China’s really big on bike riding, and they have bike-sharing companies where you can rent a bike… for one kuai an hour. So if you bike twenty minutes to the mall like me, it’s just straight up free. Uh, yes please! Faster is less cold! I guess another thing is that most students here at TBC aren’t from Loyola University Chicago. In Rome, I’d say about 80% of the students were LUC students, but here it’s less tightly knit with Chicago, so out of the 38 of us here, there are only maybe fifteen or so LUC students. Sure, we’re the biggest school here, but not the majority of people. Many people here are the only ones from their schools! But it makes it really fun and interesting. My Chinese classmate (since there’s only two of us) is from Stonehill College in the northeast, and their school is about the size of my highschool, so she knows practically everyone there. Whereas at Chicago, there’s more people I don’t know then people I do, which is the fun of it – there’s always more people to meet! One of my favorite things here is that we’ve been watching Avatar: The Last Airbender together recently. Not all of us at the same time, of course, we can’t all fit on the couch, but that’s the fun of a common lounge only for us – friends can pop in and out as much as they want! I like this small group a lot. Many people are nervous for our upcoming two weeks in Yunnan province, though, because fourteen days in close quarters with 37 other people can be tricky and hard, especially for the introverts. The other Ricci scholars and I aren’t too worried, since we survived ten days in Greece with 50 people, but it should be an experience. Next week and the week after is Chinese New Year, and I’ll be on the road, so I may not be able to post much, but I’ll make it up to you! Hang tight, and I’ll see you on next time! Also, no pictures again this week. So sorry! I had to battle the internet for a few hours today and we’re both tired from that match.